Barry is co-author of the national bestseller, ‘97 Tips For Canadian Real Estate Investors’. This book enjoyed success for achieving 1,000 days in the Amazon Top 100 Business Bestsellers. All proceeds are donated to Habitat For Humanity. Barry speaks to many groups, including the 3,000+ member Real Estate Intelligence Network (REIN). His popular ‘Tales From The Trenches’, real life stories of investor legal land mines, teach through example. ✔ Hit the ‘financing wall’ and banks are denying you more mortgages? ✔ Ever required an infusion of cash into your real estate business? ✔ Found the ‘deal of the century’ but had to walk away because you did not have access to the capital to buy it? ✔ Wanted to buy properties with little to no money down? ✔ Been looking for purchasing alternatives to the bank? ✔ Heard about no money down real estate and wondered if it was true? ✔ Wanted to buy more properties, but just aren’t sure how to get past your first one, two or three? 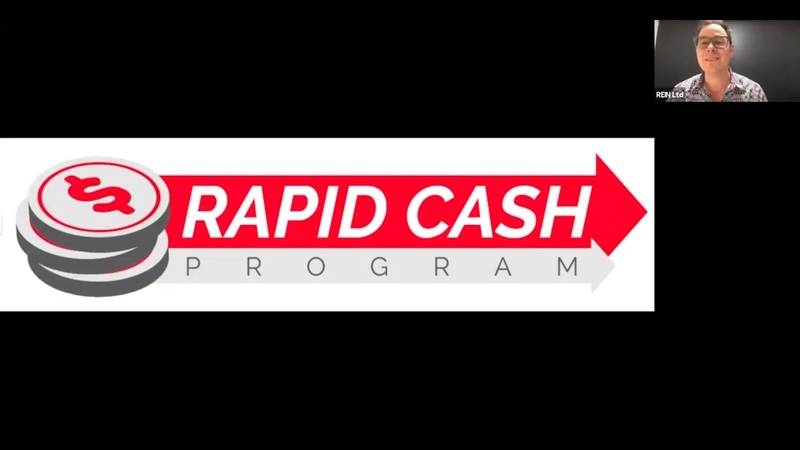 If you answered yes to any of these questions, attending Rapid Cash Program will equip you with creative strategies to generate income and grow your portfolio in ANY market cycle so you can seize opportunities and boost your cash flow! •Rapid Cash Program will lead you step-by-step and moment-by-moment through the process of finding, structuring and negotiating ACTUAL deals with REAL people, right there in the room. This isn't boring lectures or even high-energy pep talks. Instead, this event contains behind-the-scenes secrets you'll uncover by getting fully involved in the process. Program creator and leader Barry McGuire will demonstrate how to manage your time, manage your actions and make decisions based on PROVEN, established systems. Check out our recent Rapid Cash Program Webinar with Barry McGuire and International Best Selling Author, Real Estate Investor & REIN Chief Growth Officer JG Francoeur on how real estate investors are implementing Rapid Cash Strategies to amplify their portfolios and create financial freedom by design. Each person registered to attend can bring ONE guest for a discounted rate of $1995. “$8 Million & Counting” Over the past five years, I've done 30 Agreements for Sale (AFS), 25 Rent to Owns (RTO), and 8 all cash deals, with a property value of $8 million and a profit of $20,000 to $40,000 per deal. “$145K Profit in Two Years” Earlier today I put together my strongest deal yet with a $30K initial option fee, over $1,600 monthly cash flow and a $145K estimated two-year total profit. The other two deals I'm currently putting together might be even stronger. “$34,000 Instant Cash Flow” Two of the documents that Barry created have helped me do about 10 deals, and one of those two accounted for $34,000 in cash I have pocketed from assignments. It was definitely worth the time and the cost for me. “Easy To Understand and Implement” Barry’s strength is taking a rather complex technical subject and explaining it in terms that anyone can understand. He’s also excellent at looking at how legal decisions impact our actions within the business ... This is a rare talent! “Clarity and Confidence” Before attending Barry McGuire’s training events, I was unclear. Now I feel much better! This course is a must for people who want to apply Canadian quick-turn real estate strategies. My favourite part of this course? The AFS, lease options, the binder with all the information, and the CD of forms are all great!